For as long as I can remember my family has had pasta for dinner on Christmas Eve, with the holiday ham reserved for Christmas Day. My mom is well known for her lasagna, and I kept the lasagna tradition going for a while with my own family. A few years back, I decided to try something a little different while still keeping to the tradition of Christmas Eve pasta. I’ve made Penne alla Vodka and Baked Rigatoni, but this year I’ve decided to try something different and make Italian Sausage, Spinach and Ricotta Stuffed Shells. Sounds good, right? Earlier this week I gave my stuffed shells recipe a trial run and am so pleased with how it turned out. YUM. It’s definitely a holiday worthy pasta dish. Sponsored post by Mirum on behalf of Hunt’s tomatoes. 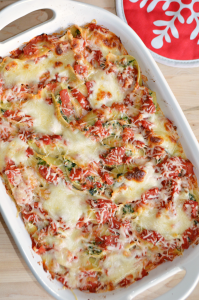 Jumbo pasta shells filled with a mixture of sweet Italian sausage, spinach and ricotta cheese. Smothered in a chunky red sauce and topped with Mozzarella and Parmesan cheeses. It’s not often that a recipe turns out perfect the first time, but this time the planets aligned giving me pasta perfection. I wouldn’t change anything about how these stuffed shells turned out. Compared to a lot of baked pasta dishes these shells take a little more time to assemble, but the end result is definitely worth it. You could use ready-made marinara for this recipe, but it takes little more effort to make your own sauce. Especially for the holidays, it is definitely worth it. There are no hard to find or expensive ingredients. I found everything I need for this recipe, including the Hunt’s Diced Tomatoes, from Walmart. 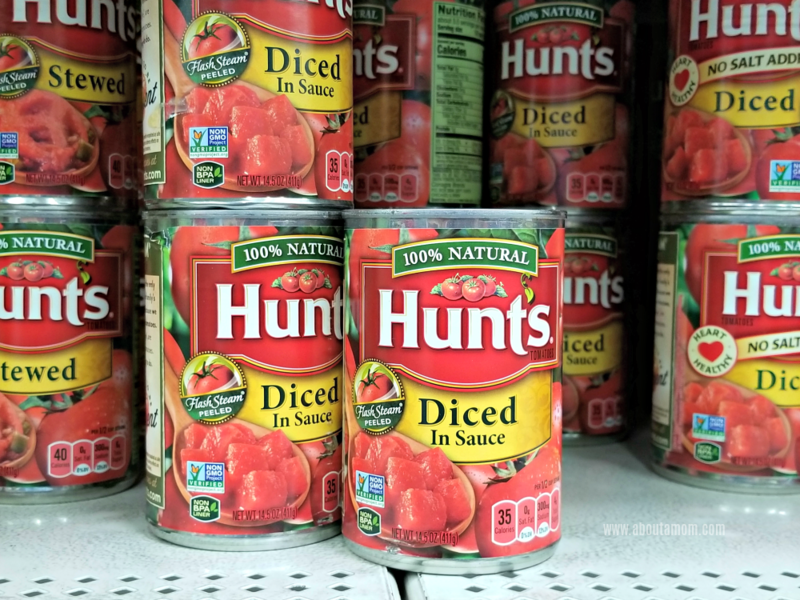 I always use Hunt’s tomatoes when making my own sauce. They are the purest tomato, from field to can with nothing in between. You can really taste the difference. Bring a large pot of salted water to a boil. Cook pasta shells according to the instructions on the package. Drain, rinse in cold water, and set aside. Heat olive oil in a large skillet on medium high heat. Add the onions and cook until softened, a few minutes. Add sausage to the pan, breaking up the sausage into smaller bits. Cook sausage about 5 minutes, until cooked through, and no pink remains. Add the garlic and cook until fragrant, about 1 minute. Remove pan from heat. In a bowl, combine diced tomatoes and sauce and Italian seasoning. Spread half of the diced tomatoes into the bottom of a 9×13 baking dish. In a large bowl, beat the egg lightly. Mix in the ricotta, chopped spinach, 1/2 cup of the Parmesan cheese, parsley, salt, pepper, and sausage mixture. Fill each cooked pasta shell with some of the ricotta, spinach, sausage mixture. Arrange the stuffed shells in the baking dish. Spread remaining diced tomatoes over the pasta and sprinkle with mozzarella cheese. Heat oven to 375°F. Cover baking pan with aluminum foil and bake for 25 minutes. Remove foil, sprinkle with remaining Parmesan cheese and bake uncovered an additional 10 minutes. Note: Depending on how much filling you put into each pasta shell, you may or may not use the entire box of shells. I was very generous with the filling and ended up with 27 shells. You should be able to feed 8-10 people with this recipe, with a serving size of 3 to 4 shells per person. Also, you could easily assemble this dish a day or two ahead. Just cover with foil and keep in the refrigerator until you are ready to bake it off and serve. 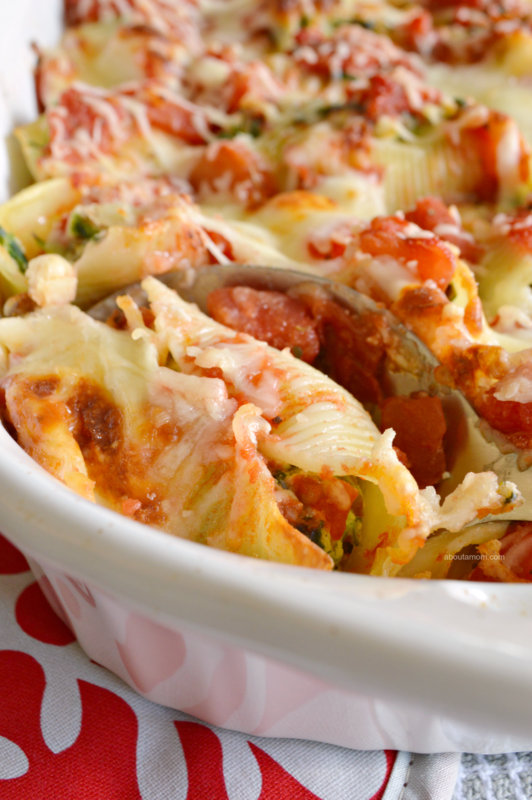 This Italian Sausage, Spinach and Ricotta Stuffed Shells recipe is kid friendly. My picky 9-year old absolutely loved these stuffed shells. What is your family’s Christmas Eve dinner tradition? Every tradition starts from scratch. 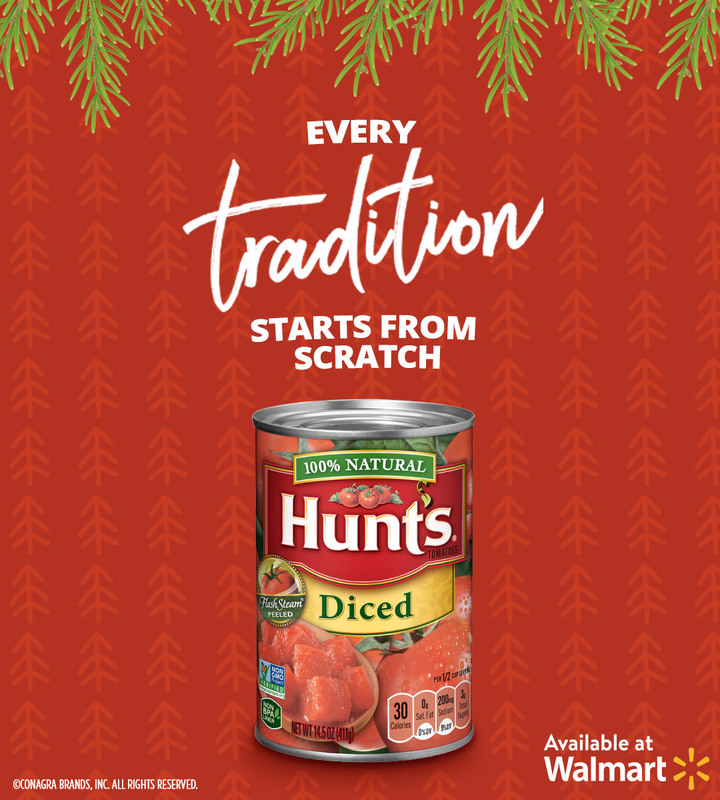 Visit the Hunt’s website for more holiday recipe inspiration. In a bowl, combine diced tomatoes and sauce and Italian seasoning. Spread half of the diced tomatoes into the bottom of a 9x13 baking dish. Oh my gosh, I love love love stuffed shells so i have to try this recipe ASAP!Thanks so much for the idea, it sounds / looks wonderful. This sure looks good, and i haven’t tried stuffed shells with sausage. I’d like to try it! I never really thought of adding spinach to stuffed shells but it sounds good. I feel like I have been making the same recipes the same way for so many decades it is time for me to start experimenting again. This looks delicious!! I love dishes like this. This would be perfect for a weeknight or a lovely weekend meal! Yum! I love different pasta dishes and this one looks pretty easy to make too! Yum these look so good. My kids love stuffed shells and I havent made them in such a long time. Going to have to this weekend! These look so delicious! I haven’t made stuffed shells in years. My kids love them too. I should make some for the holidays. This sounds like a good meal for a winter evening. I’m vegetarian and may try the recipe minus sausage. I do like stuffed shells. 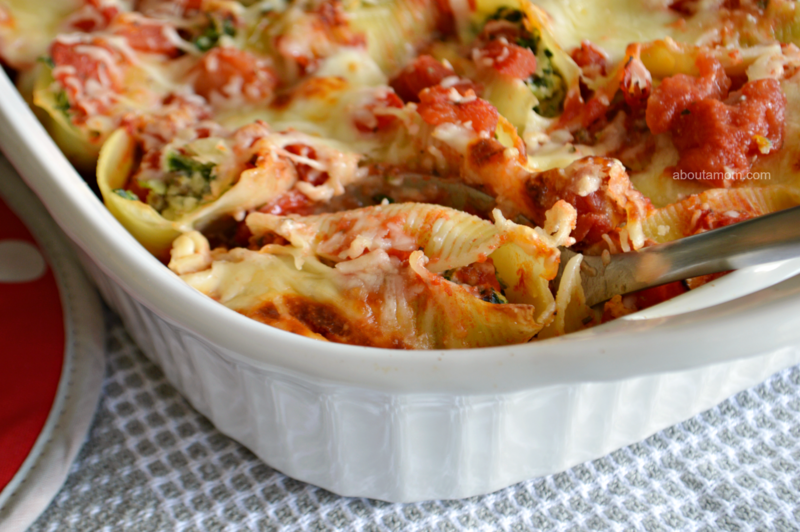 I make stuffed pasta shells but a lot different form this recipe. This one looks really good. I like that it has spinach. We are tired of the same ol’ pasta dishes. This one looks delicious and has one of our favorite greens – spinach. We love to eat Italian dishes! This looks so delicious and full of flavor! This would make a really great Christmas eve meal! We always do Italian food and this sounds great! I am going to make this delicious Recipe. 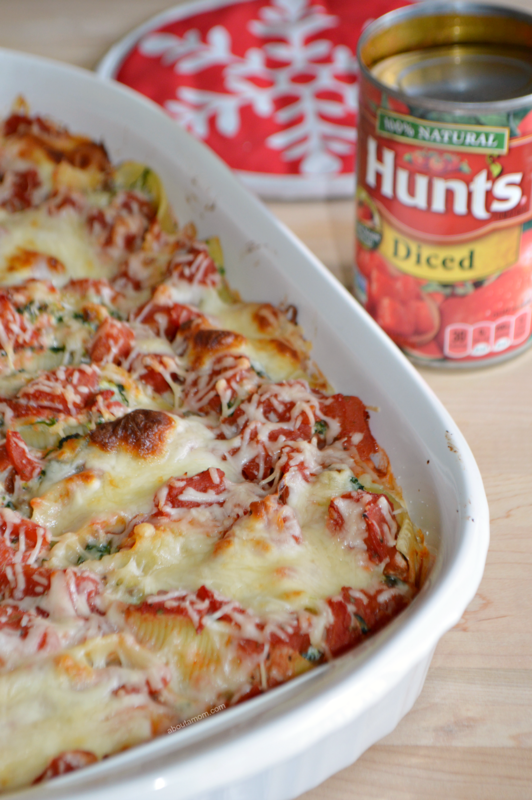 We love stuffed shells and this is such an easy recipe for me to try out! My mother is half-Italian so it goes without saying that we love Italian food. I think this is the perfect meal for the holidays. This looks as though this would be a delicious meal. I am going to have to try making this sometime this week! OMG this dish look absolutely delish! Definitely adding this recipe to my “to-do” list. Thank you! Our family Christmas Eve tradition is to open 1 gift and we read Luke chapter 2 from the Bible & The Night Before Christmas. Thank you for sharing this recipe, it looks delicious! These look and sound delicious. I make something quite close to this only I havent used thespina ach in mine before. I am going to give it a try. I have also usedd burger instead of Italian sausage as it has less of a zing to it but either way would be really good. Such a nice hearty dish. One of our favorite dishes. This recipe is pretty similar to the one I use. It’s been a long time since i made this. My husband loves Italian sausage! Thanks for sharing this delicious recipe! Will be making this for the family over the holidays, it has the colors of Christmas (red and green)! This a real winner. You just can’t beat something so easy to make that tastes wonderful. Great recipe and perfect comfort food for these cold days. Also a great crowd pleaser for a gathering. Thank you for the recipe. This recipe looks so delicious & easy to make. I will be trying this soon! OMG this recipe looks so yummy I just add it to my must try list, I will make this for my family weekend dinner this week. This is a great winter time dish to warm the bellies and fill them with yumminess. This sounds so good, especially today while it so cold. We don’t have a particular dish that we make no Christmas Eve.We generally just have finger foods & egg nog or hotcocoa. Your pasta dish oooks so yummy that I want to try it for any dinner! Thank you for sharing this recipe. I just love Italian food. These stuffed shells look sooo tasty. I need to make this. can I cook the recipe instead of using an oven? suppose I use steamed appliance?